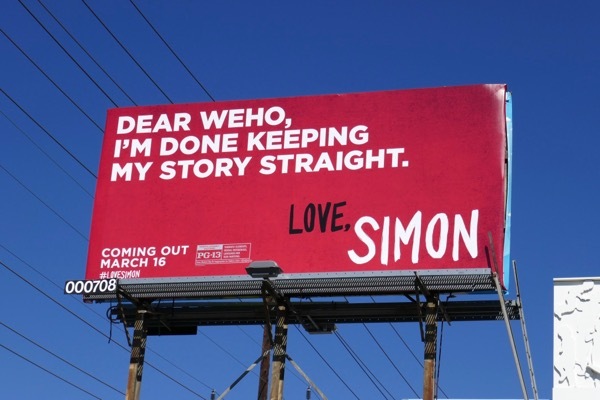 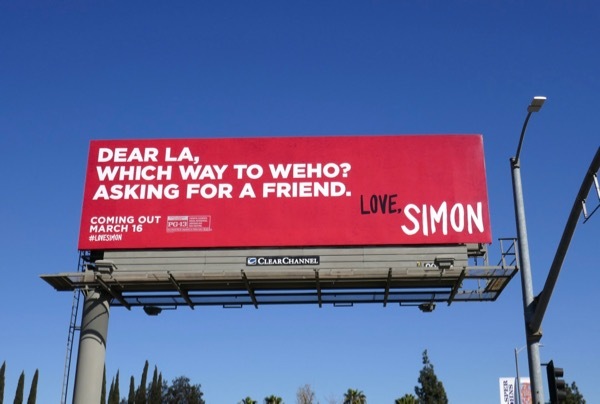 Sometimes words can help sell a movie far more than one particular image, and these billboards for new gay coming out comedy Love, Simon prove that point beautifully. Greg Berlanti directs this love story starring Nick Robinson as the titular closeted 'Simon Spier' who secretly connects with another anonymous gay high school student online called 'Blue' and starts to fall for him. 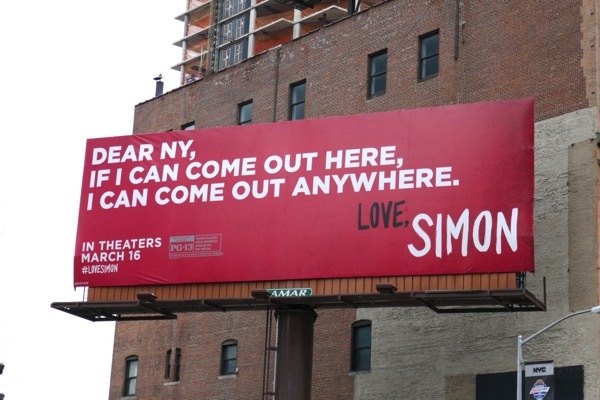 The path to true love never runs smooth and everyone's coming out story is unique to them, so let's hope this adaptation of Becky Albertalli's 2015 novel, Simon vs The Homo Sapiens Agenda, proves to be as charming and funny as the movie's outdoor advertising. 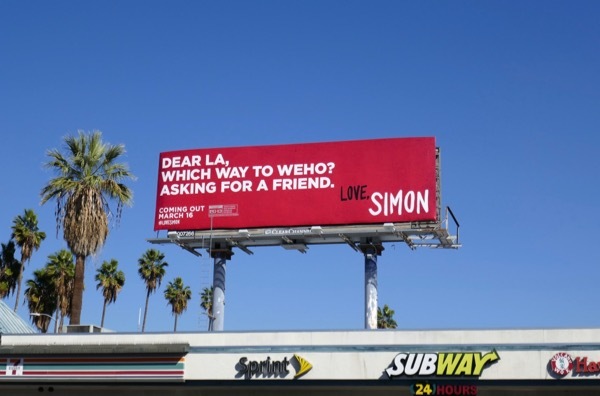 West Hollywood obviously has a thriving LGBT community and like the play on Frank Sinatra's New York, New York song suggests, lots of gay people are attracted to the cosmopolitan city that doesn't sleep hoping to proudly be their true selves. 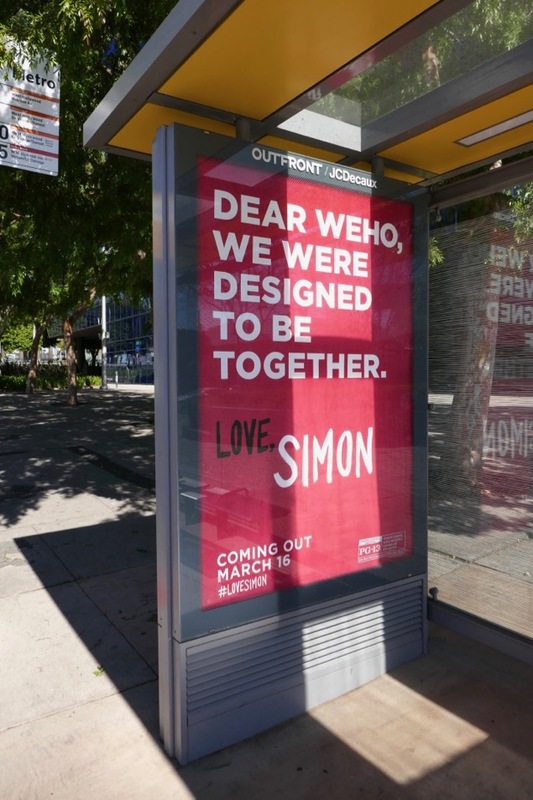 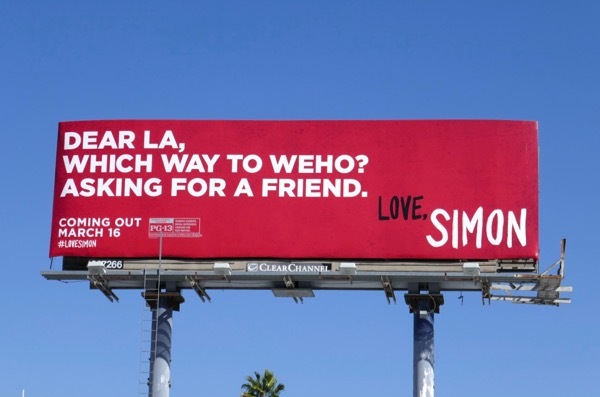 These locally tailored Love, Simon billboards and ads are hilarious and really well located, from bus stop shelter posters outside coffee shops, to targeted ad creatives next to the West Hollywood's Pacific Design Center. 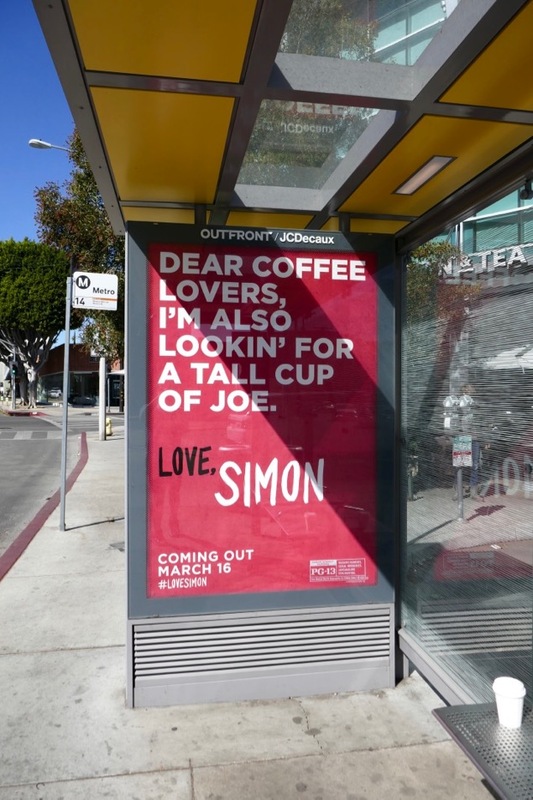 All these bold, red copy-only billboards and poster ads for the romantic comedy were snapped around the streets of L.A. and Manhattan from February 16 to February 24, 2018. 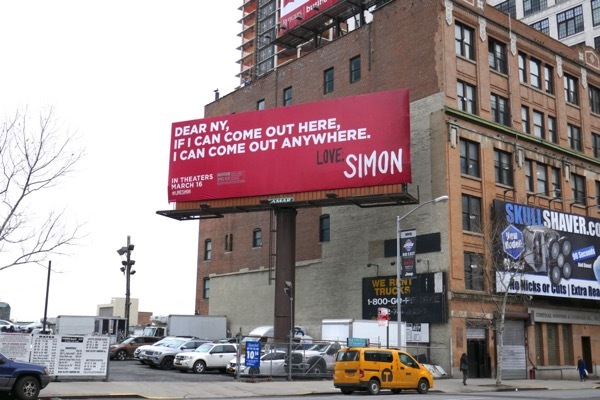 For more LGBT love and coming out stories, you can also check out these billboards for Call Me By Your Name, Moonlight movie billboards and these Transparent TV billboards. 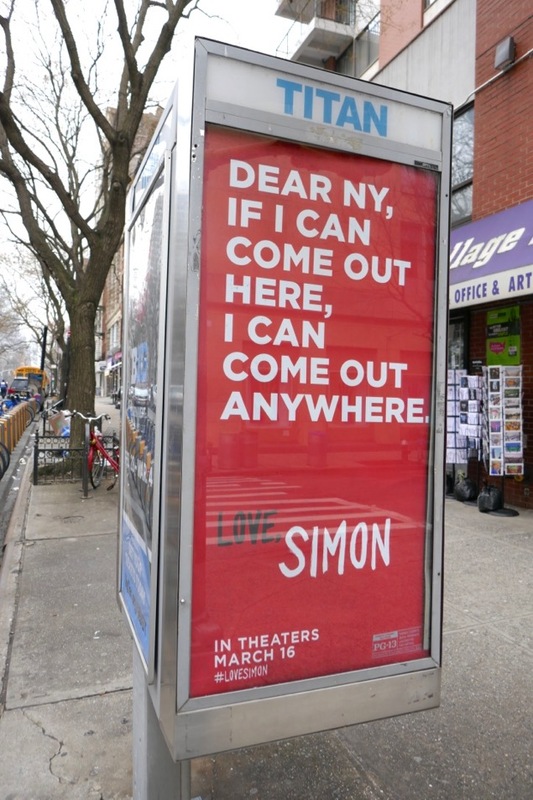 One day it would be great if people didn't feel the social stigma of coming out, but until then movies like this can only help promote awareness, tolerance and acceptance of gay people in the world for generations to come. 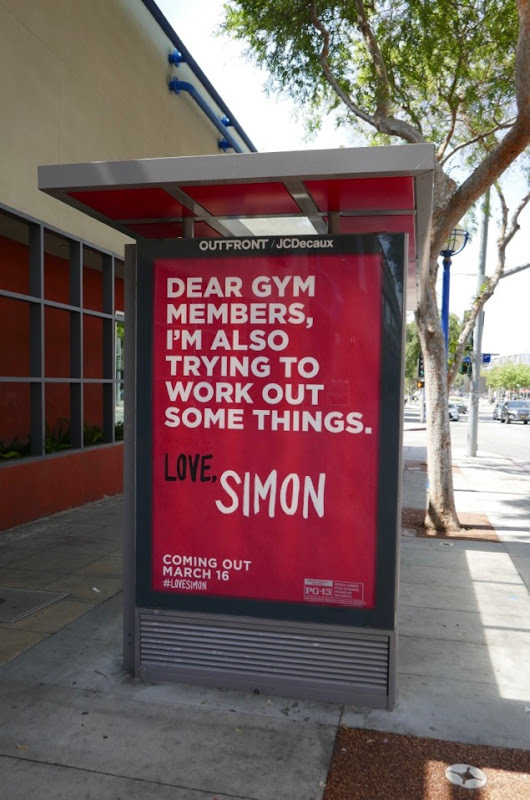 UPDATED: Here's another fun bus shelter ad poster for Love, Simon spotted outside West Hollywood's 24 Hour Fitness along Santa Monica Boulevard on April 10, 2018.